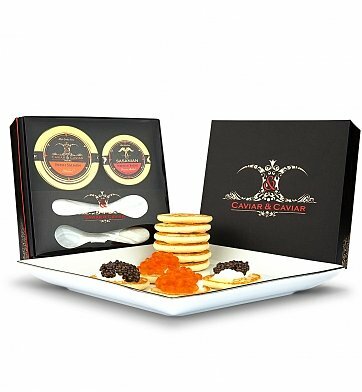 Exclusive only to GiftTree, Caviar & Caviar offer up a selection of fine Siberian caviar and wild Alaskan salmon roe, served on savory Russian blinis with Mother of Pearl serving spoons. It's the perfect gift for an intimate brunch or small gathering. Siberian Baerii Sturgeon Caviar: Dark grey medium-sized creamy pearls, raised in pristine settings with fresh, clear water. One ounce. Wild Alaskan Salmon Roe: Large orange pearls boast a fresh ocean breeze flavor with a hint of sea salt. Two ounces. This royal gift set arrives presentation-ready in an elegant gift box. Regal Caviar Gift is a hand delivered gift. These gifts are delivered by one of our local design centers located throughout the United States and Canada. Same day delivery is available for most gifts when ordered before the cutoff time. The cutoff time for Regal Caviar Gift is 9 AM in the recipient's time zone. Siberian Baerii Sturgeon Caviar and Wild Alaskan Salmon Roe.